OPINION: Should Classic 500 Pegasus Owners Feel Betrayed By Classic 350 Signals Edition Launch? The launch of the Classic 350 Signals Edition has sparked some anger amongst Pegasus owners in India. Is there truly a reason to be annoyed? Motorcycle enthusiasts in India who bought Royal Enfield’s limited edition Classic 500 Pegasus have recently expressed their annoyance at the launch of the new Classic 350 Signals Edition. And rightly so, as just within a month of them struggling to get their hands on the Pegasus, RE went ahead and launched a bike that looks similar, isn’t a limited edition, costs quite a bit less and is equipped with ABS. But we dig in to explain why Royal Enfield Classic 500 Pegasus owners should take pride in what they own, instead of feeling regret for not waiting for the Signals Edition. The Classic 500 Pegasus is a limited edition motorcycle with only 1000 units across the world. So you get exclusivity that no other Royal Enfield rider can enjoy. What makes the Pegasus even more special is that just 250 units of it were made for Indian enthusiasts, with a Pegasus logo on the fuel tank and a unique serial number stencilled on it. The Classic 350 Signals Edition is not a limited edition model and so it will be found in every other alley you come across, theoretically. Especially since the Classic 350 is Royal Enfield’s highest selling motorcycle. Also Read: What Royal Enfield Could Have Done To Avoid The Backlash From Classic 500 Pegasus Owners? The Classic 500 Pegasus edition pays tribute to the RE/WD 125, also known as the Flying Flea, which was used by British paratroopers during World War II. This bike played a major role in the most famous battles during the war, such as Arnhem and D-Day. So Pegasus owners own a bike that honours a piece of history and serves as a reminder of the sacrifices made by the men and women who fought for the world peace we enjoy today. The Classic 350 Signals Edition, on the other hand, pays homage to the heroes who protect our skies and our land on a daily basis. So while both are designed to respect the warriors and the keepers of peace, would you not take more pride in owning something that played its key role in helping countries achieve world peace? Think about it! Since when did people start to associate Royal Enfield with technology? The cult bikemaker is known for making bikes that offer a sense of pride and passion. You will never find a Royal Enfield fan speak about performance, handling capabilities, features, or even design for that matter. Lets face it, every RE owner knows that they’re not buying a Royal Enfield for the technology on offer. People are willing to own this badass thumper as it resonates with history, it resonates with the pure emotion of riding a raw motorcycle. It’s no wonder the the brand still enjoys such a strong cult following, despite lacking the modern touches other motorcycles have. The 500cc motor gives you around 10PS and 12Nm more torque over the Classic 350’s motor. So when it comes to highway cruising, you will ride with a lot more relaxed engine. We are not talking about speed here because RE’s have never been about speed, but about the experience you get on the ride. So should you be feeling cheated? To round things off, owning a Pegasus is owning a memorial to World War II. 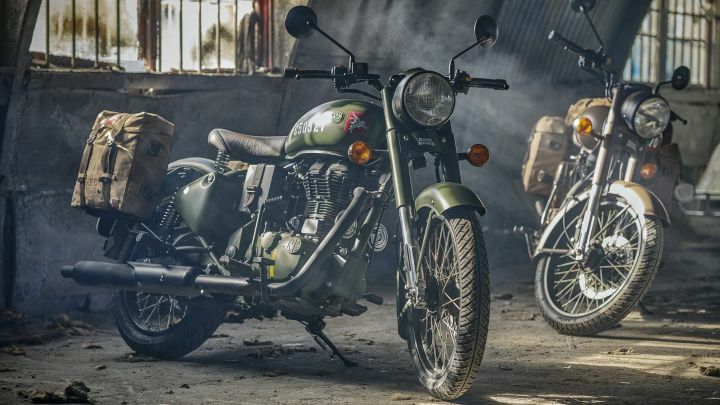 Apart from this you get the exclusivity of a limited edition model and, of course, a lot more grunt over the Royal Enfield Classic 350 Signals Edition. Royal Enfields have always been associated with ruggedness, masculinity, simplicity and the joy of riding. That’s what makes them special, and the Pegasus simply heightens that emotion to a whole new level. As far as similar styling goes, the Pegasus has a seperate set of logos and paint scheme to set it apart from the two colour options on the Signals Edition, so there’s no chance that the Pegasus will be identified as anything but the unique motorcycle that it is. I am a Pegasus 500 owner and feel cheated by RE. This is a terrible article almost putting salt on the wounds of people who loved RE like anything and were scammed by the company. I am a Pegasus 500 owner and feel cheated by RE. This is a terrible article almost putting salt on the wounds of people who loved RE like anything and were scammed by the company. A great example of how paid stories are. Don't you feel shameful while doing this. RE has betrayed the fan following a big time don't be their paid visiting card. A great example of how paid stories are. Don't you feel shameful while doing this. RE has betrayed the fan following a big time don't be their paid visiting card. Mr. Karan, you won't understand our feeling as you don't own a Pegasus bike. Be in our position and understand dude. Mr. Karan, you won't understand our feeling as you don't own a Pegasus bike. Be in our position and understand dude. Pls see your self and let us know what is limited abt this limited edition Pegasus. Pls see your self and let us know what is limited abt this limited edition Pegasus.